The Daniel Boone Wilderness Trail Association has published a history of the Blockhouse that was built in 1775 on the North Fork of the Holston by John Anderson. 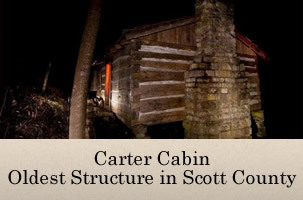 His fortified home became a landmark along the road west, the Wilderness Road, marked by Daniel Boone that same year. Over the next thirty years, some 300,000 people passed Anderson’s home on their journey through Cumberland Gap and on into what would become the state of Kentucky, and further westward. William L. Anderson, a direct descendant of John, has written a well-researched book that tells the story, the history of the home that became known to posterity as “The Blockhouse,” and its part in the expansion westward of our new nation. The Daniel Boone Wilderness Trail Association is proud to offer this book that tells, for the first time in such detail, the very significant part played in our nation’s history by the pioneer settlers of the western frontier during the last quarter of the eighteenth century. Also included in the book are many brief biographies of significant players in the story, maps, an article on Fort Blackmore, and the diary of early explorer Dr. Thomas Walker.